As you know I love pizza and I make it often. I was craving a cheesesteak, but didn’t have a roll to make my own and I don’t live close to any places that make really great cheesesteaks. If I’m going to consume all those calories in one sitting, I want it to be good! 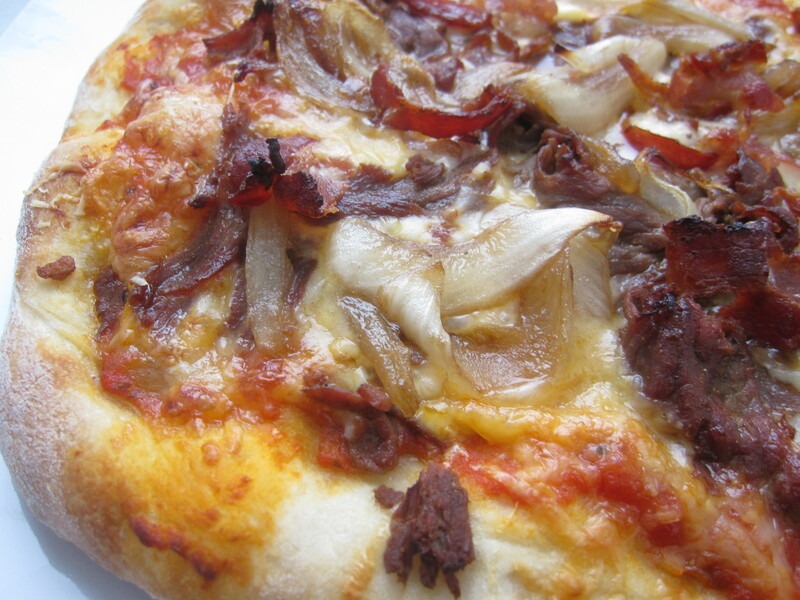 I made my usual pizza dough and caramelized some onions. I basically took what I had in my fridge and used it for this pizza. I had one pack of sliced top round that I picked up from Whole Foods. It’s so cheap and it cooks in minutes. For the finished pizza, I added a three cheese marinara, a blend of parmesan, gruyere and colby jack cheese, caramelized onions, steak, and a little crumbled bacon. Sooooo good! OMG…this looks awesome! We make pizza at home quite often and our favorite is onion and bacon….but this would take it to an all new level! How do you make your caramelized onions? I have not attempted them yet. Thanks for sharing your yummy pizza! I love anything with onions and bacon! For the caramelized onions I use a large sweet white onion sliced and cook it in about a tablespoon of butter on low heat until the onions are very soft and have wilted down. This can take 30 min-45min. Then a add about a teaspoon of brown sugar and balsamic vinegar so they onions get a nice brown color. Thats it! That sounds easy enough…I have always been told its a complicated process, but this sounds great, thank you! Have you only ever done this with a vidalia? Just curious at what would be a good substitute if vidalia wasn’t available. Thanks! You can definitely use any type of onion. I have done it with red onion and just regular white onions. They’re great on burgers too!